Here in the South, we are firm believers that bourbon makes EVERYTHING better! This rich, boozy caramel sauce is no exception. Starting with a base of fresh cream, pure cane sugar, Madagascar vanilla and a hint of fleur de sel, this sauce gets a further dose of flavor from a hit of top notch Kentucky bourbon. Drizzle over ice cream or add a spoonful to your after dinner coffee. Pairs well with yogurt, fresh fruit, pancakes, waffles and apple pie! 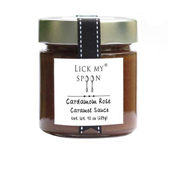 Since its 2013 launch when founder Kristine Insalaco-Gaioni was making just 4 jars of Caramel Sauce at a time, Lick My Spoon has earned five consecutive annual Good Food Awards. Using no artificial flavorings or preservatives, Kristine continues to develop sauces she dubs "American classics with Italian influences," calling up her family's Italian roots. Your purchase also helps provide jobs—the packaging is completed by teens and young adults from a special needs home paid to place the labels in the home's commercial kitchen. Fall for this feel good company that invites you to Lick Your Spoon again and again. Read our interview with Lick My Spoon's Kristine Insalaco-Gaioni on our Taste.Savor.Share Blog.